Parliament Budget Session HIGHLIGHTS: The Parliament Budget Session ends tomorrow. Parliament Budget Session HIGHLIGHTS: Both Houses have been adjourned for the day. The Rajya Sabha was adjourned following an uproar by Samajwadi Party members after party chief Akhilesh Yadav was allegedly stopped at Lucknow airport while on his way to Allahabad. While the Citizenship Bill was not tabled today in Rajya Sabha as scheduled, Lok Sabha concluded its session passing the Finance Bill, 2019 and discussing issues including tourism in India, GST. Union Home Minister Rajnath Singh was likely to table the controversial Citizenship (Amendment) Bill in Rajya Sabha Tuesday. The Citizenship Bill was passed in Lok Sabha in January. Assam and other north-eastern states have been witnessing protests over the Bill that seeks to provide citizenship to religious minority groups from Afghanistan, Pakistan and Bangladesh. Lok Sabha has passed the Finance Bill, 2019, while Citizenship Bill is pending in the Rajya Sabha. Both Houses stand adjourned for the day. Follow HIGHLIGHTS on Parliament Budget Session here. Lok Sabha stands adjourned for the day after passing Finance Bill, 2019 and concluded discussions on varied issues including from employment in the tourism sector, GST, Finance Bill, 2019. While clearing doubts on the Finance Bill, Finance Minister Piyush Goyal in the Lower House said that tax-related proposals in the bill are aimed at helping the poor and the middle-class people living on a tight budget. Goyal proposed to raise tax rebate for people having annual income up to Rs 5 lakh from Rs 2,500 to Rs 12,500, which will effectively ensure that they don't have to pay any tax. Those having income of up to Rs 8-9 lakh too can take advantage of this if they invest in tax saving schemes. The tax proposals are aimed at helping "poor and middle class people living on tight budget", Goyal said while moving the Finance Bill which contains tax proposals of the government. The Lok Sabha resumes at 3 pm, post-adjournment, and discussion continues over the Finance bill and Rafale in the Lok Sabha, while two bills including International Financial Services Centres Authority Bill, the Cinematograph (Amendment) Bill were introduced in the Upper House. Opposition and members of the Samajwadi Party approached the well of the Upper House and protested against alleged stopping of SP chief Akhilesh Yadav at the Lucknow airport which was aimed at preventing him from visiting Allahabad. As a result, the Deputy Chairman of the House adjourned the proceedings till tomorrow at 11 am. The ruckus over the issue had begun earlier today by the SP members, however, Chairman m Venkaiah Naidu stated that nothing would go on record. atmosphere. This is not the way. We have lost so much of valuable time," Naidu said before adjourning the proceedings till 2 PM. The SP chief was on his way to Allahabad to attend an oath-taking ceremony of a student leader at Allahabad University. Meanwhile, Uttar Pradesh Chief Minister Yogi Adityanath said the step was taken on the request of the varsity as there was apprehension that Yadav's visit might cause violence in the campus. Rajya Sabha adjourned till 2.36 pm following an uproar by Samajwadi Party members after party chief Akhilesh Yadav was allegedly stopped at Lucknow airport while on his way to Allahabad. Rajya Sabha resumes amid protests by Opposition. The controversial Citizenship Bill is likely to be tabled in the House. Home Minister Rajnath Singh says: "We have already had a discussion on Rafale. The case has also gone to the Supreme Court. This is politics where they are using lies to misguide public." In Lok Sabha, Mallikarjun Kharge is addressing the House. Raising the issue Rafale deal in the House, Kharge reiterated the demand for a JPC probe. "Why is the prime minister scared? We demand a JPC probe." Congress leader Anand Sharma has given a suspension of business rules notice in Rajya Sabha over 'irregularities & alleged corruption in the acquisition of Rafale jets'. Venkaian Naidu had a friendly advice for a JD(U) MP asking him to "speak" instead of "reading" from the papers. The MP was talking about the facilities in AIIMS. Earlier, JD(U) leader Kahkashan Parveen sought Bharat Ratna for former Bihar Chief Minister Karpoori Thakur. Union Minister Ravi Shankar Prasad is responding to the lawyers' strike. "The government has an open mind and high regard for lawyers. We are already in discussion with the lawyers on their demands." Ghulam Nabi Azad is addressing Rajya Sabha. "There are some responsibilities both on the government as well as Opposition. Passing the interim budget, a motion of thanks on President Kovind's address is our responsibility." He requests the House to take up the Motion of Thanks today and discussion of the Budget tomorrow. Union Minister Vijay Goel calls for extending Rajya Sabha proceedings if the Opposition agrees. Parliament proceedings begin in Rajya Sabha and Lok Sabha. 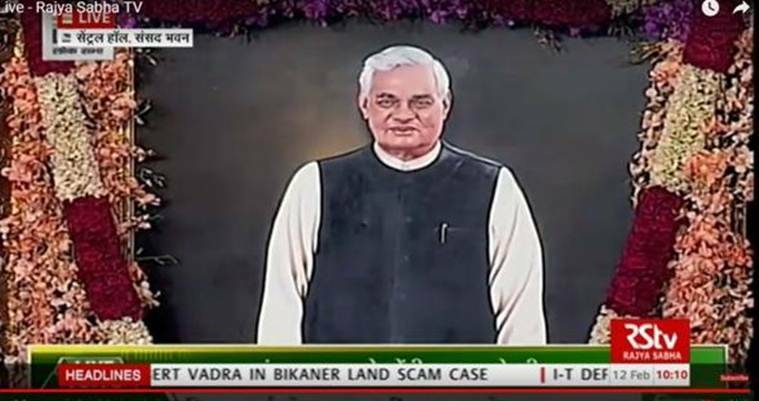 Meanwhile, this morning, President Ram Nath Kovind unveiled a portrait of former Prime Minister Atal Bihari Vajpayee at the Central Hall of Parliament. Remembering the BJP stalwart, Prime Minister Narendra Modi said, "Atal Ji had a long political career, a large part of that career was spent in opposition. Yet, he continued raising issues of public interest and never ever deviated from his ideology," reported ANI. Congress leader Ghulam Nabi Azad also said that the former prime minister will be "remembered because there was criticism in his words for the opposition but in his heart, there was no anger against the opposition." On the CAG's Rafale report, Congress leader Mallikarjun Kharge said the government might give the "same suggestions here which they gave to Supreme Court in a sealed cover." Talking to reporters outside Parliament Kharge said, "Let’s see what all they have written in it." What is on agenda in Parliament today? Apart from this, Union Minister Maneka Gandhi will table The Protection of Children from Sexual Offences (Amendment) Bill, 2019 in Lok Sabha. 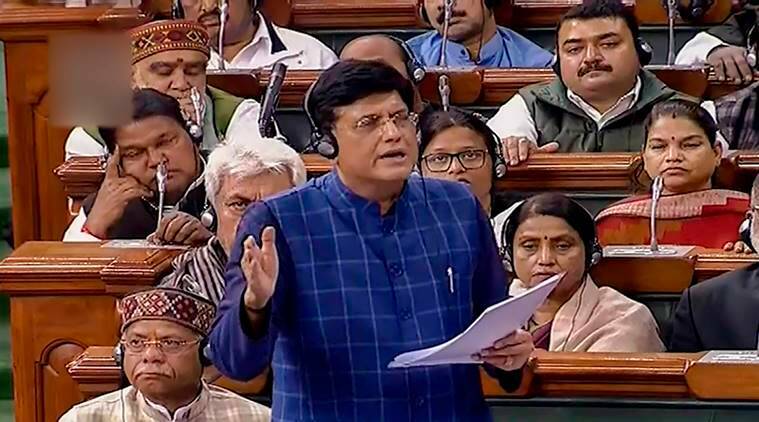 Union Minister Piyush Goyal will introduce The International Financial Services Centres Authority Bill, 2019, while Rajyavadrhan Rathore will introduce The Cinematograph (Amendment) Bill, 2019 in Rajya Sabha. The Parliament Budget Session ends tomorrow. Welcome to the live blog. A stormy session is ahead in Parliament as the CAG report on Rafale deal, Citizenship Bill is likely to be discussed in the House today. Follow this space track to latest news. The interim budget was passed in the Lok Sabha Monday amidst sloganeering by the TDP MP’s demanding special status for Andhra Pradesh and walk-out by the Congress, NCP and CPI-M. Proceedings in Rajya Sabha, meanwhile, were washed out for the sixth day in a row amid uproar by the opposition over various issues including special status for Andhra Pradesh. Only two bills were introduced before Congress and TDP MP’s trooped into the Well, following which the Chairman M Venkaiah Naidu adjourned the House till 2 pm. When the house met again, the disruptions continued forcing Deputy Chairman Harivansh to adjourn the house for the day. “It is unfortunate that members are not allowing the discussion to continue despite consensus in the business advisory committee,” Harivansh said.